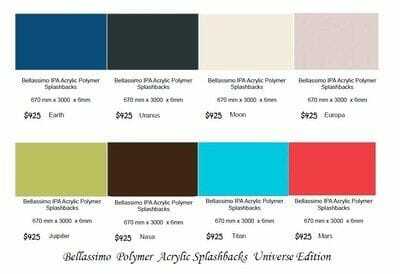 ISPS Innovations brings you the environmentally friendly colour range that reflects our Universe called Bellassimo Acrylic Splashbacks. ISPS has chosen the most popular colour base perfectly costed in these timeless set colours. 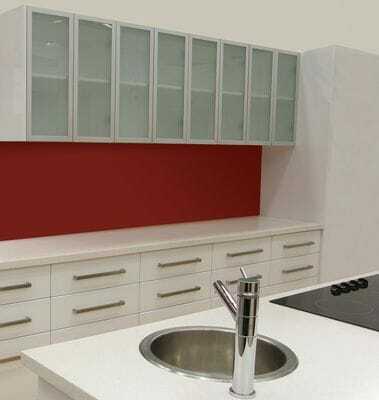 You dont need a motive to buy a DIY Acrylic Splashback call ISPS Innovations today. National Delivery to to your door step. Try IPA Acrylic with Griptek backing. Supplying custom coloured Acrylic Bathroom & Kitchen Splashback & Wall Panels Marker Boards & Whiteboards to Melbourne and Victoria, Adelaide and South Australia, Sydney and NSW, Brisbane and Qld, Northern Territory,Darwin and Alice Springs, Perth and Western Australia, Tasmania and Hobart. Nation wide Service like no other. 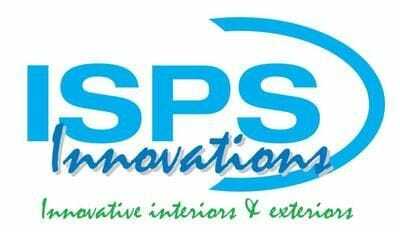 With ISPS Innovations you are buying direct from the manufacturer saving you time and money. ISPS Innovations creates custom toughend glass insert for behind the cooktop which is available in silver or can be colourtoned to blend with Bellassimo sheeting. You may choose to be different and create your own colour! 50% lighter than glass, Bellassimo polymer sheeting can be cut, drilled,planned & polished on site. Easy to clean simple warm soapy water, rinse residue and wipe with damp cloth. ISPS DIY Splashbacks dry and shine. Grout is out the door, making it easier to clean and maintain. Gas Burners requires AGGA compliant toughened glass insert, which ISPS can customise to your requirements, in either silver or colour toned application. Colour tone carries up to 25% variation, so ISPS focusses on depth and tone of colour to bring a uniformed finish. Any Acylic splashback should not go behind any cooktop. See Bonethane Premium Splashbacks for induction, ceramic and electric cooktops. 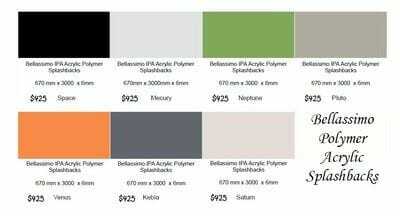 Note our Bunnings Splashback range which was Bonethane and IPA Acrylic Splashbacks are now available direct through ISPS Innovations.